Astrophotography requires abundant patience and planning, but as Spanish photographer Dani Caxete has shown, you sometimes need quick reflexes, too. His entry in the Astronomy Photographer of the Year 2018 contest shows the International Space Station (ISS) superimposed on the sun, in between two large sunspots. He didn't have a lot of time to grab it -- traveling at 5 miles per second, the ISS took just 0.5 seconds to pass in front of our star. You have to be in the right place at the right time too, of course. Caxete uses an app called CalSky, tells you where to be in order to capture celestial bodies like satellites, the Sun, Moon and planets like Mars. It told him that the space station would pass directly in front of the Sun at 11:34:45 AM on September 5th, 2017 at a precise location near a road in Madrid, Spain. In a fun video (above), Caxete documented his day capturing the photo. It shows him heading toward the shooting location, intercut with footage from the ISS as it passed the USA and Atlantic ocean on its way to arriving between Madrid and the mid-day sun. Caxete set up his modest, but sharp Long Perng 80mm f/6.8 refractor telescope, attached to a 24-megapixel Nikon D610 full-frame DSLR. With the scope pointed directly at the sun and a filter to drastically lower its brightness, he captured five images of the ISS passing in front of the sun. 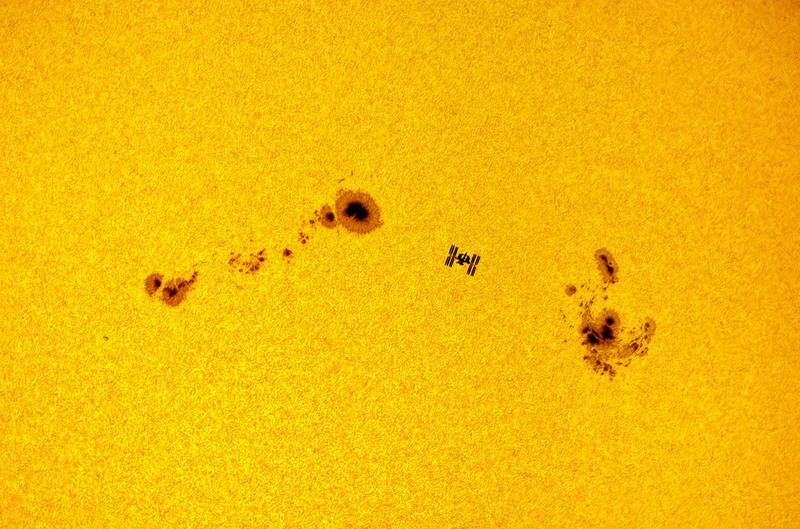 The best is the one shown above, with the ISS transiting directly between the sunspots AR 12674 and AR 12673 that flared during September 2017. The photo is entered in the Astronomy Photographer of the Year 2018 contest, which features a number of photos from some of the best astrophotographers in the world. Many of them are amateurs with relatively modest equipment, as the competition bars images submitted to photo agencies, or those that contain data from professional research observatories. The winner will be picked on October 23rd, and featured in an exhibition of the winning images over the last 10 years at the National Maritime Museum in Greenwich, England.